Original image via Wikimedia Commons. Back when I was in sales, we had a saying, Fail to plan and plan to fail. I have a lot of people ask how I manage to get so much done, and much of it boils down to planning and TNT. We can’t use TNT if we don’t plan. Aside from the explosive stuff Wile E. Coyote employed in his many unsuccessful attempts to snag a roadrunner, TNT is Today NOT Tomorrow (a great acronym I learned in Peg Pickering’s book, The Art of Getting It Done). The world will never reward us for what we intended to do. In Part One, we explored the notion of being busy versus fruitful. I also shared a neat, yet scary bit of math. We can miss out on a lot of great stuff because of five minutes wasted. Just wasting 5 minutes, 12 times a day adds up to over 340 hours in a year (over TWO WEEKS or 31.6 eight-hour work days). Planning helps us maintain focus. I can tell when I have failed to plan and make lists. For instance, I had a WAY off day yesterday. Many of you might have noticed this because it’s the first time I have failed to post a blog in four years. Anyway, I went the store (no list) and forgot the three main things I went for, yet managed to buy $100 worth of stuff. Yes, I needed the “stuff” but I REALLY needed new dishwashing gloves, dog food and envelopes. Also, since I didn’t make a list, I forgot to bring the two things I needed to MAIL (ergo why I needed envelopes), which would have been simple to mail since the post office was on the way HOME. Now, I have to go BACK to the store to get the envelopes and go to the post office. This is easily 45 minutes I blew because I didn’t take FIVE minutes to make a list. Planning can feel very counterintuitive. We feel like we are wasting time sitting down and making lists and agendas. Yet, a little bit of preparation can give a major return on investment. Your Time is Valuable: How Are You Spending It? Time-effectiveness studies conducted by DuPont demonstrated that, for every one minute spent planning, the time required to complete an activity is reduced by 3-4 minutes. Spend 10 minutes, reduce completion time by 30-40 minutes. Spend an hour, reduce by 3-4 HOURS….When properly used, 15 minutes of planning can effectively control your time for an entire day (The Art of Getting it Done, pg 64). Ever had a day where you know you did a lot, yet you were miserable because you felt like nothing was truly accomplished? Humans tend to take the path of least resistance. We will fold laundry or tidy the fruit bowl instead of tackling the hard stuff, the stuff that scares us. Involves doing something out of our comfort zone. Doing something out of our natural skill set. Tackling something overwhelming in size. Yet, the ugly stuff is also what gives us the best returns. These are what Brian Tracey calls FROGS, and they must be eaten FIRST. Unless you’re from the bayous of Louisiana, the idea of eating a frog makes us cringe…so we put it off….and off…and we will do it Monday or start next month. Whenever I start feeling “depressed” I stop myself. Am I really “depressed’ or am I overwhelmed? What frogs are bouncing around out there that need to be eaten? What is scaring me? Uneaten frogs hop around in our heads and distract us. They keep us from sleeping well. My FROGS this week? 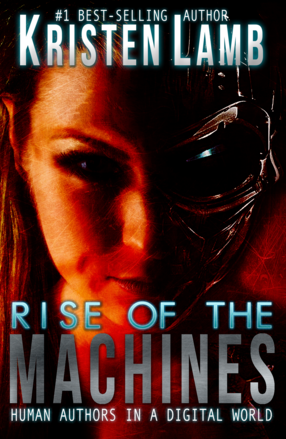 Final planning for WANACon, taxes (UGH), finalizing a paper version of Rise of the Machines–Human Authors in a Digital World. I am a relatively new entrepreneur. WANACon is a revolutionary conference that brings all the best of a writing conference to YOUR HOME for a fraction of the cost (only $119 if you sign up before the 15th). Real, live interaction with top-tier professionals, NYTBSAs, editors, Amazon, etc. But we have to train speakers to use the technology, recruit shepherds/moderators, and create forms to systematize our processes (NOT my area of strength). I am new to self-publishing (part of why I recruited Amazon to present at WANACon). I’m slow because I don’t understand as much as I need to. I’m used to being fast, confident and in control. Now? I feel like a moron (but I’m learning). Taxes scare me. I once had a panic attack on the phone with a lady from the IRS who practically had to talk me off a ledge, and they owed ME money. When we plan, we need to be honest. Write down the BIG stuff, the stuff that scares you. Then employ TNT, Today Not Tomorrow. Some frogs are bigger, grosser and uglier and maybe they can’t all be eaten in one day. Break it up, then blast each part with TNT. As an example, I was injured in college and couldn’t work for a time. I had to use credit cards to live. Debt piled up. How did I eat THAT Frog of Debt? I listed all the credit cards and payed the minimums on all except the smallest. I focused all my efforts paying off the card with the lowest amount. I worked from smallest to largest, eventually paying them all off. Did the same with the medical bills. No, I couldn’t pay off the $3,500 ER bill, but I could pay $30 towards it. I could then pay OFF the $68 x-ray tech fee and work my way up until even the big stuff was eaten. Why smallest to largest? Because we need to feel accomplishment or we get discouraged. Small victories add up, and give us energy and confidence. Make planning and TNT-Frog-Eating a habit? You’ll be shocked how much you will get accomplished. What are your thoughts? Are you discouraged? Overwhelmed? Have you struggled and found a system that helped you slay your frogs? Since it was such a HUGE success and attendees loved it, I am rerunning the Your First Five Pages class SATURDAY EDITION TOMORROW. Use the WANA15 code for 15% off. Yes, editors REALLY can tell everything they need to know about your book in five pages or less. Here’s a peek into what we see and how to fix it. Not only will this information repair your first pages, it can help you understand deeper flaws in the rest of your manuscript. WANACon, the writing conference of the future is COMING! We start with PajamaCon the evening of October 3rd and then October 4th and 5th we have some of the biggest names in publishing coming RIGHT TO YOU–including the LEGEND Les Edgerton. If you REGISTER NOW, you get PajamaCon and BOTH DAYS OF THE CONFERENCE (and all recordings) for $119 (regularly $149). Sign up today, because this special won’t last and seats are limited. REGISTER HERE.